I had big plans to post a 5 for Friday post last night but this short week and my daughter's 11th birthday yesterday did me in!! Paragraph writing has begun. While we have been working on paragraphs indirectly (retells, persuasive paragraphs, opinions) this week we started looking closely at the nuts and bolts of paragraph writing. You may remember that I am a big (huge) lover of Paragraph of the Week by Stephanie from Teaching in Room 6. This was our first week using this resource (that I may or may not have mentioned, I love). Our word study this week was all about Bossy R. I love the little posters I made. I also love that due to the short week we are carrying it over to next week (woohoo). 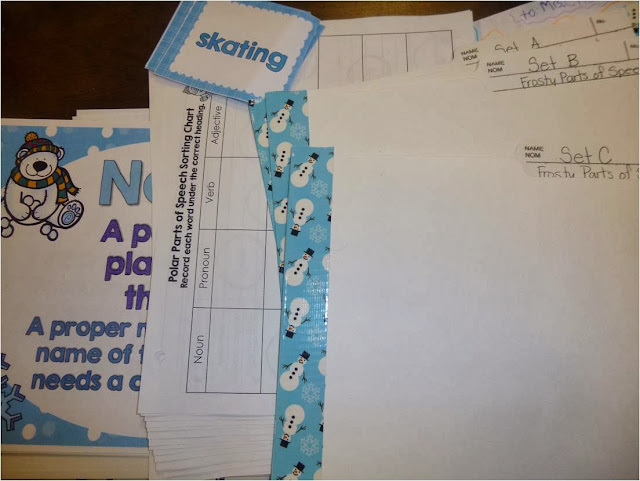 My grade 3's were reviewing parts of speech - and we had loads of fun doing group word sorts and color the snowball. 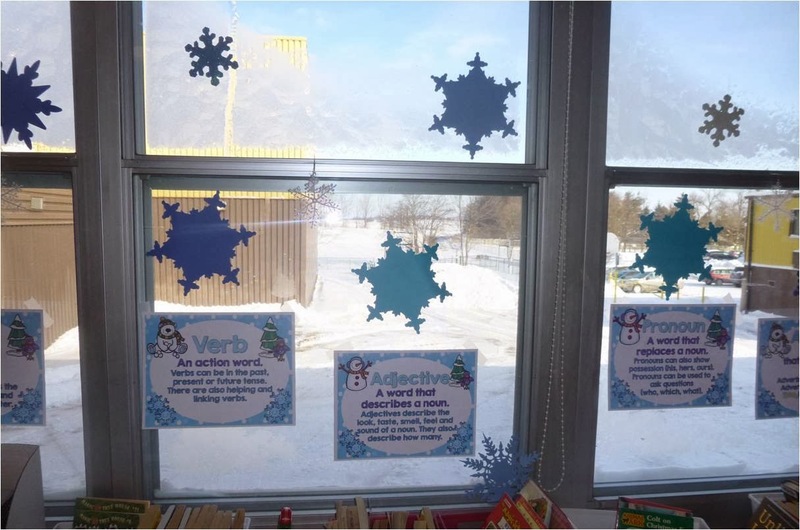 I love that the posters are so wintery and so are my windows (why, yes some of those snowflakes on the windows were made by my new Cricut). You may notice in the picture, the lovely color version of the word cards printed on cardstock....but I also made a set on regular paper in grey scale to have a snowball fight (and to Spark Student Motivation of course!!). So here is what we did, first we reviewed the 5 parts of speech we had been working with all week (nouns, verbs, pronouns, adjectives and adverb). I gave each student a stack of the word cards. 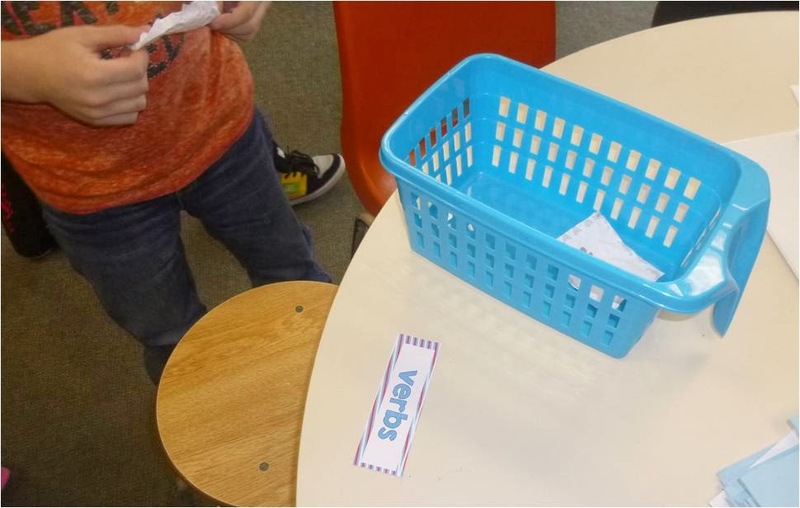 I placed baskets around the room and gave a label to each basket. 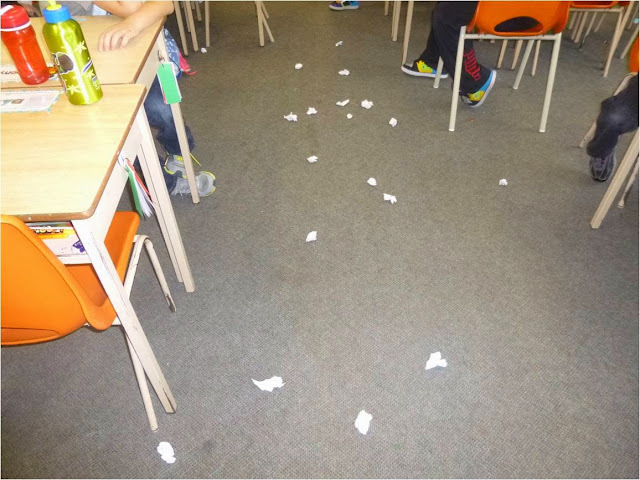 Students scrunched up their papers into snowballs. On the word go they all threw them (keeping to our desk/carpet area). On the count of 3 everyone found 1 snowball and sorted it into the right basket - the first time they were allowed to check withme. Then on the count of 3 everyone got two snowballs and sorted - without help. We still had enough to go again and get three snowballs (I only have half my class at this time). Then I stopped them and I read through the baskets - I read out loud any cards that were correctly sorted and left them in - if there was a word that did not belong - I crumpled it back up and threw it (the kids love this - especially if you aim somewhat near them!). Then we kept going - they kept going till they were all sorted. There were about 4 that were tricky for them and we used the posters and figured them out as a group. 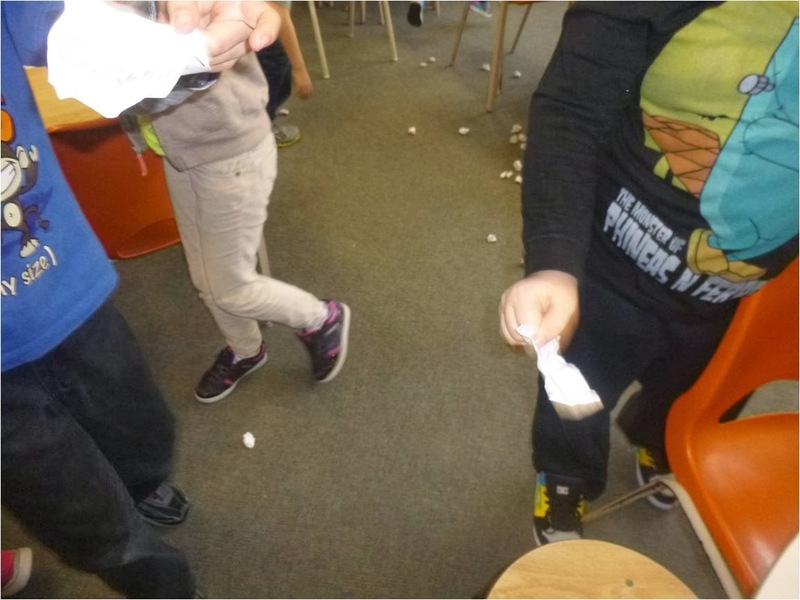 I have done a snowball activity before where they find a question (math) and have to take it to their desk, answer it and then throw it again - which is also big fun. This is the first time we tried it with sorting though. You could do it with math questions too. If you had a true and false basket and had math equations that the students had to decide if they were true or false or even baskets with the answers and they had to put the question in the right basket. I know this is the same idea that our lovely hostess Joanne is sharing this week but what can I say - great minds and all that. Be sure to check out her blog today for your last chance to enter the amazing giveaway and check out more ways to motivate your students!! Love the snowball idea! It could be used in so many ways... Thanks so much for sharing! I love your word work posters! They are adorable! I have also done snowballs with math, but never thought about parts of speech. Love it! Those Bossy R posters are amazing. I have just started focusing on this with my third grade intervention students. I am heading over to check those out right now! Happy belated birthday to your daughter! Love the ELA twist on the snowball fight! And I like that they have to sort the "snowballs" into categories! Which also means the kids clean up the mess! Win-Win! I hope your daughter had a great birthday! Your windows look great! And, great minds do think alike! How funny that we both had a snowball fight! Thanks for sharing and linking up my friend!!! I love the snowball idea. It sounds so much more fun the a typical sort. I am going to give it a try soon. Thank you! I love Stephanie's Paragraph of the Week resource too! 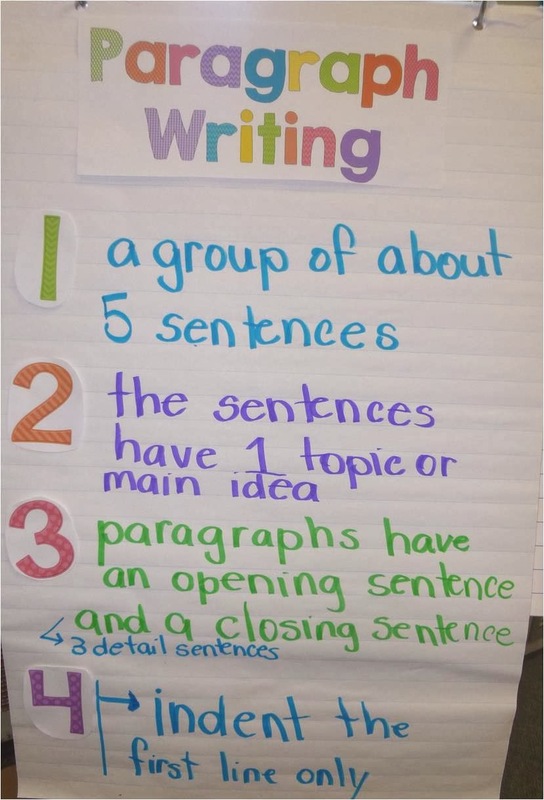 It's a great way to teach paragraph writing! I did a snowball activity this week in math and the kiddos loved it. I never thought to do it with sorting. Thanks for sharing this great idea! Hope you have a great week! Thanks for sharing such a fun idea! This time of year I'm always looking for more ways to get my students up and moving around!